QMobile NOIR A600 is one of the best smart phone among the recently launched phones of all the major manufacturers. This phone has a cutely slim waste line and very graceful body. It is a light weight phone with impressive specifications . One of its glaring feature is its large 5.0" HD screen that gives very glamorous and pleasant display. It handles all your work with very ease thanks to its Quad-Core processor. It also have a 8.0 MP auto focus camera on board to snap high quality images. Let's check what is inside its retail box. Here is a Unboxing video of QMobile NOIR A600. 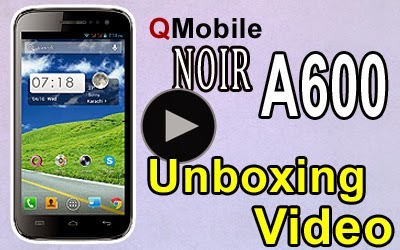 QMobile NOIR A600 Unboxing Video in Urdu from Bilal Saeed on Vimeo.